“Our first baby was born in water, at home on Saturday November 25th at 4.15pm. Regular contractions started at 12pm after a quiet morning with a few cramps, and when the midwife arrived at 1pm I was 4cm dilated. 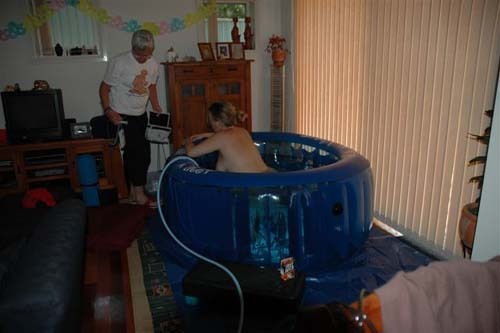 I laboured on ‘dry land’ for a while until I was dilated enough to get into the pool, which was set up in our lounge room. As soon as I got in the pain eased away and I felt so much more comfortable. This was what I had been hoping for but it was even better than I imagined! After about half an hour of relaxed floating and moving around in the pool, pushing contractions started. I think the warm water must have sped up the process quite a bit! It was much easier dealing with the contractions in the pool as I was able to move much more freely. I sat on my knees, with my arms over the edge of the pool for each contraction, and my husband Mark held my hands. In between contractions I stretched my legs backwards and just floated. At 4.15pm, Oliver shot out with one big push- head and body at once! After a few big screams he relaxed straight away and lay in my arms for a few minutes in the nice warm water. I delivered the placenta quite easily in the pool, and then got out to do our first breast feed. It was a fabulous experience!